Today, Opera becomes the first major browser to integrate social messenger services, allowing users to chat side-by-side as they browse. With the release of the new browser, codenamed “Reborn”, Opera continues on the path to redefine what a web browser should be. Over the last few years, web versions of social messengers have increasingly become popular. However, switching between tabs when responding to a message has been cumbersome and inefficient, until now. With the new browser, Opera allows the messengers to reside within your browser without the need to install any extensions or apps. Over the last year, Opera has introduced a series of novel features such as free VPN and native ad blocking. 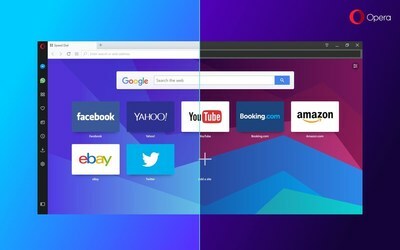 At the beginning of 2017, the company released Opera Neon, a concept browser that captured the essence of how browsing might look like in the future. Opera Neon allowed users to hop between discovering new content and chatting with friends, or even sharing online discoveries while browsing. Now, this part of Neon has been brought to the “Reborn” Opera browser. This release, in addition to the new messenger experience, brings a fresh look, new icons, colors, wallpapers and a touch of animation.